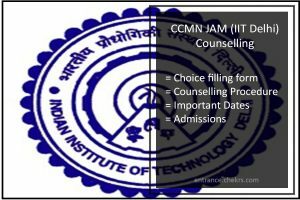 IIT JAM Counselling 2017 (सीसीएमएन च्वाइस फ़िलिंग फॉर्म 2017): The Indian Institute of Technology, Delhi is going to conduct the JAM Counselling 2017 from 4th May for all the JAM qualified students. The admission to the M.Sc courses will be provided through the CCMN Counselling. The students will be allotted seats in the 18 different NITs and CFTIs. The Centralised Counselling for M.Sc Admissions to Nits and CFTIs was firstly started in 2015. The students who clear the cutoff of JAM 2017 they are eligible for the CCMN Registrations 2017. The students who have successfully qualified the JAM exam which was conducted by IIT Delhi, they can fill the CCMN Registration Fee on or before 28th May 2017. The students have to fill their choices before 30th May. The students will be allotted seats according to the IIT JAM Seat Matrix. The students must have to carry their JAMS Scorecard with them on the day of counselling. The aspirants must have cleared the JAM 2017 exam. They have scored more than 60% or 6.5 GPA in their graduation. Candidates must be eligible according to the age requirement specified by the IIT JAM. The clarification fill is done with the help of 10th mark sheet. The candidates from other than general category have to submit their valid caste certificate approved by the Indian Government. These document will be submitted on the day of document verification. The candidates have to show their valid PWD certificate approved by the Medical Board. The students who will be allotted seats through IIT JAM Counselling List. They have to report at the allotted centre on the specified date. the students must note that they must have the final mark sheet of their graduation. If they fail to do so before 30th September their admissions will be rejected. The CCMN Counselling Result will be announced after the completion of every round. For feedback and more queries regarding CCMN JAM 2017, you can contact us by commenting in the comment section given below.